Harry, I'd love to listen to your system one of these days! 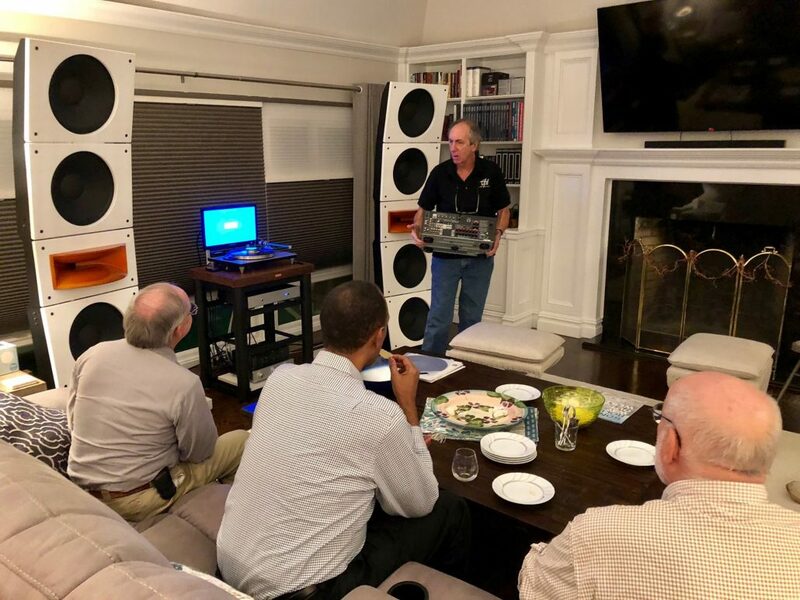 This speaker system is very intriguing. Hello, sort of new guy here. Have been lurking around for a bit. Waiting on my first VPI table. Glad to hear positive impressions of these speakers. I've been seriously considering the Trio 10 Beyma configuration in PlyBoo. I have a smallish listening room, and I am fond of Horns. Had a chance to hear the Quintet and was duly impressed. Hands down the best Bass I've heard from an open baffle. Gary1955 wrote: Will do Harry, thanks! Make sure you get the full audition treatment! Here's a little something I found on the Pure Audio site. Is there a computer control that is fixing the placement issues, or are these speakers designed to interact in a positive way with room boundaries (a la Amer Bose)? Many of the pictures show them very near walls, and even corners. That's a picture from last year so everything you see in the rack is not there anymore. The Quintet's are being driven by custom made 20 watt j-fet amps (more than enough), a Yamaha pre/pro that does the room correction beautifully, a Voyager phono section and Levinson phono section, all wired with Nordost Odin 2. Playing the One Step MFSL Donald Fagan was as close to master tape as we have ever heard using the Classic Direct Drive, 3D gimbal Fat Boy, and Lyra Atlas or the ART-1000. For what these speakers cost they have to be the biggest bargain in audio. The system gives goose bumps and you can lift the amps with one hand!!! Recently put in a pair of Merril Audio Thor class D amps and with that power you can reproduce an organ and contra-bass ( Gary Karr recording) at realistic levels at the same time in your living room. Without a box the low end is amazingly clear and clean, you can feel the strings vibrating and the bow moving. As someone with limited square footage, my favorite Pure Audio configuration to this point is below. I have not had the opportunity to audition these, but as a confessed lover of well done horn speakers, it is a future possibility. The best speakers I have owned in my audio journey was a pair of Klipshorns, followed by Klipsch Cornwalls, and Belles. My experience with those high efficiency speakers also taught me the value of using "clean" low watt power amplification, as opposed to mega watt high negative feedback power sources. If these sound as good as they look, they are definitely something to look forward to possibly owning. They sound amazing. I disconnected the top and bottom woofer and it is so close I can highly recommend the Trio PAP horn combo. You are correct, low wattage very clean amps sound wonderful.